Who are the homeless? Are their numbers significantly increasing because of the recession? Read some eye opening and sobering facts about homelessness in America and find out what you can do to help. Different definitions of homelessness are used in different contexts. Generally, homelessness is defined as a person who "lacks a fixed, regular, and adequate night-time residence." 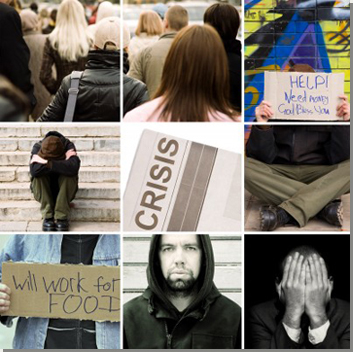 How is the recession affecting homelessness? The recession will force 1.5 million more people into homelessness over the next two years, according to estimates by The National Alliance to End Homelessness. In a 2008 report, the U.S. Conference of Mayors cited a major increase in the number of homeless in 19 out of the 25 cities surveyed. On average, cities reported a 12 percent increase of homelessness since 2007. Although homelessness is a difficult number to measure definitively, it appears that more people—especially families—are sleeping in shelters, living in their cars, and taking up residence in tent communities. The number of homeless is difficult to ascertain because estimates vary depending on the methodology used. Numbers also vary substantially depending on whether a measurement is taken on a single night or is extrapolated to a given year. One approximation of the annual number of homeless in America is from a study by the National Law Center on Homelessness and Poverty, which estimates between 2.3 and 3.5 million people experience homelessness. According to a 2008 U.S. Department of Housing and Urban Development report an estimated 671,888 people experienced homelessness in one night in January 2007. Some 58 percent of them were living in shelters and transitional housing and, 42 percent were unsheltered. Which states have the highest rates of homelessness? Alaska, California, Colorado, Hawaii, Idaho, Nevada, Oregon, Rhode Island, Washington State, and Washington, D.C. have the highest rates of homelessness, according to a study released in 2007 by The National Alliance to End Homelessness. How many of the homeless are children? One out of 50—or about 1.5 million—American children are homeless each year, according to a 2009 study by the National Center on Family Homelessness. According to the National Alliance to End Homelessness, 23 percent of homeless people are reported as chronically homeless. According to HUD's definition, a person who is "chronically homeless" is an unaccompanied homeless individual with a disabling condition (e.g., substance abuse, serious mental illness, developmental disability, or chronic physical illness) who has either been continuously homeless for a year or more, or has had at least four episodes of homelessness in the past three years. In order to be considered chronically homeless, a person must have been sleeping in a place not meant for human habitation and/or in an emergency homeless shelter. What are the greatest causes of homelessness? Are veterans more likely than other populations to be homeless? Yes. About 40% of homeless men are veterans, although veterans comprise only 34 percent of the general adult male population, according to research on veterans by the National Coalition for Homeless. On any given night, 200,000 veterans are homeless. What are some other demographics of homeless people? Racial and ethnic minorities, particularly African-Americans, are overrepresented. Note: The above figures are based on a 2006 study by the US Conference of Mayors. Homelessness continues to be a largely urban phenomenon. Note: The above figures are based on 1996 data from Samhsha's National Mental Health Information Center. People who are homeless frequently report health problems. What legislation exists that addresses homelessness? The McKinney-Vento Homeless Assistance Act was the first—and remains the only—major federal legislative response to homelessness. President Ronald Reagan signed the act into law in 1987. The Act, which has undergone many changes since its inception, has resulted in several programs that have helped hundreds of thousands of Americans regain stability through emergency shelter, transitional housing, job training, primary health care, education, and some permanent housing. However, critics claim the greatest weakness of the Act is that it responds to the symptoms of homelessness more than its causes. How do you measure homelessness? 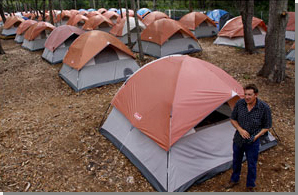 Measuring homelessness is difficult because of the fluidity of the homeless population. Part of the difficulty stems from varying methodologies used to measure homelessness. Some researchers attempt to count all the people who are literally homeless on a given day or during a given week, called a "point-in-time" count. Critics say this method is likely to overestimate the number of chronically homeless and underestimate the number of people who experience temporary homelessness. A second method of counting homeless people examines the number of people who are homeless over a given period of time, also called a "period prevalence" count. Critics of this method point to the difficulty of standardizing measurements. Other affecting factors in measuring homeless rates include the duration of counting and time of year of counting. The U.S. Department of Housing and Urban Development (HUD) has recently instituted standardized reporting requirements to include both those inside the system (in shelters), and those outside (unsheltered) using a point-in-time count.